Zone913, Inc. is an independent media and publishing company specializing in limited-edition Artwork and books. Its intention is to delight and excite you with changing collections of Fine Art photographs. The name Zone913 comes from the ancient Maya concept that we humans live and create on this thin membrane of Earth that lies between the 13 layers of the bright Otherworld and the 9 levels of the dark Underworld. This concept is illustrated in the Maya pyramids. 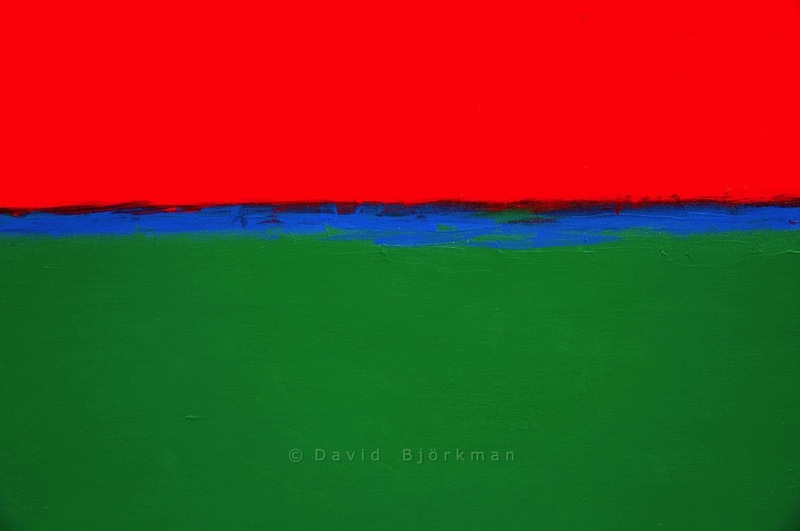 To connect these three zones in contemporary terms, this Minimalist painting by David Björkman illustrates the contrast in the Universe. He says: "Like the Maya, we inhabit this watery blue zone, which is our space to create. For the first time in recorded history, we have the technology available to us for making our dreams come to life, while we are in balance between the two opposing forces, here painted in red and green." "Plus," he adds, "starting and growing a small business is an experience that seems to encompass all of the 9 and 13 realms - both heaven and hell. A small company's longevity should officially be measured in dog years." Established in 1998, Zone913, Inc. aspires to bring you creative works that fill your heart and senses with joy.